Various literary sources suggest that Irish monks reached Ultima Thule (Iceland) by the end of the 8th century CE where they established a temporary hermitage (A New History of Ireland, Vol. 1, 2005, 320, 624-625). 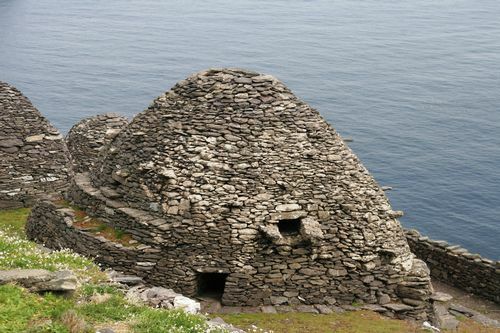 For some idea of the limited nature but harsh material reality of these hermitages, explore the World Heritage site on the Skellig Michael hermitage built in the 7th century CE off the west coast of Ireland. Fig. 1 Skellig Michael (Michael's Rock) monastic hermitage, 7th Century CE, West Ireland. (example of type of settlements that may have been developed in Iceland by Irish monks). By about 871 CE, Norse voyagers reached and settled Iceland in the first of a series of explorations of the North Atlantic. These settlements in Iceland relied on the development of a small but relatively autonomous peasantry with a priestly leader whose status was passed on as a hereditary right. (Charles Wickham, The Formation of Early Modern Europe, 2006, 374). Eventually the Norsemen expanded their expedition, looting the coastal islands and coast regions of the North Atlantic. Under the leadership of the legendary Eric the Red, they reached and settled Greenland by around 985 CE. Archaeology indicates the total population probably peaked at around 5,000 settlers that lasted until around 1350 CE. During the time of Leif Eriksson around 1000 CE , other Norse settlers led by Bjarni Herjolfsson reached Labrador and areas of Newfoundland. There they harvested wild grapes in a tentative settlement known as Vinland. These settlements were abandoned by the 15th century, perhaps due in part to problems of sustainability, the consequence of a period of climatic cooling, (the Little Ice Age), and hostility toward Inuit peoples who bordered their areas. (Thomas Benjamin, The Atlantic World, 2009, 54-55). A key study on Iceland that makes use of archaeological evidence is J. Byock, Viking Age Iceland (2001). Gunnar Karlsson, Iceland’s 1100 Years, relies on Icelandic literature and sagas. 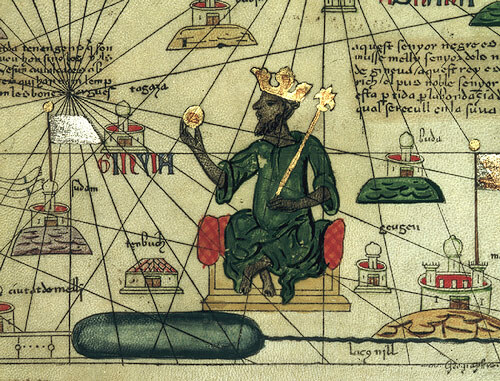 The legend of Abu Bakr II, the Malian leader who abdicated his throne in 1311 CE to lead an ocean exploration of the Atlantic is one of the most intriguing mysteries of Atlantic exploration and history. The sources are limited, but the various accounts suggest that this African king decided to sail out across the Atlantic with anywhere from 400 to 2,000 ships. Surviving accounts related that the fleet was lost in a major storm. The account was told by his successor Mansa Musa, the Malian king who visited Cairo with a large caravan loaded with gold, and related the story, which was reported by the Egyptian historian al-Maqrizi.